(November 25, 2013 – Culver City, CA) Sparks & Shadows, a new boutique record label founded by composer Bear McCreary, announces the release of the DEFIANCE Soundtrack, Deluxe Edition on November 29th. The album, features two CDs, one containing 22 tracks of original score, original songs and cover songs as heard in the first season of DEFIANCE, and the other 22 tracks of original score MMO game. As a special bonus, the first 360 people who buy the album at www.lalalandrecords.com, on December 3rd, will receive their copy autographed by McCreary. McCreary will also be signing DEFIANCE, along with his recent CD releases including Da Vinci’s Demons, Battlestar Galactica: Blood & Chrome, and Europa Report at Dark Delicacies (3512 W. Magnolia Blvd., Burbank) at 2PM on December 7, 2013. In the year 2046, it’s a new Earth – with new rules. Over thirty years after various alien races arrived on Earth, the landscape is completely altered, terraformed nearly beyond recognition. To the town of DEFIANCE, on what used to be St. Louis, comes the mysterious Nolan (Grant Bowler) and his charge, Irisa (Stephanie Leonidas). As they settle into town – overseen by the mayor, Amanda Rosewater (Julie Benz) and filled with residents like the powerful Rafe McCawley (Graham Greene), enterprising lounge owner Kenya (Mia Kirshner) and the ambitious, alien Tarrs (Tony Curran and Jaime Murray) - events begin to unfold that threaten the fragile peace this border town has fought for. The series is executive produced by Kevin Murphy (Desperate Housewives, Caprica, Hellcats), who also serves as showrunner, Michael Taylor (Battlestar Galactica) and Rockne O’Bannon (Farscape). Scott Stewart (Legion, Priest) directed the pilot; Michael Nankin serves as supervising producer/director on the series. DEFIANCE is produced by Universal Cable Productions. As the events of DEFIANCE unfold weekly on your TV screen, you can see how the residents’ struggles impact the game of DEFIANCE, a high-octane, multi-platform experience from Trion Worlds! For the first time in history, a TV show and a game exist concurrently in a shared universe, influencing and impacting the other! As show runner Kevin Murphy describes, “The town of Defiance is an immigrant melting pot and its music reflects this.” McCreary set out to create a musical history for each of the races playing a part in DEFIANCE’s dramatic landscape. WIRED Magazine called Bear McCreary a “Secret Weapon” in a recent issue. His unique combination of atypical instrumental background (he is a professional accordionist) with rigorous classical training prepared him to compose for disparate genres. By the age of 24, McCreary was launched into pop culture history with his groundbreaking score to Syfy’s hit series Battlestar Galactica, for which he composed “the most innovative music on TV today” (Variety). It “fits the action so perfectly, it’s almost devastating: a sci-fi score like no other” (NPR). Io9.com declared Bear McCreary one of the Ten Best Science Fiction Composers of all time, listing him alongside legends John Williams, Jerry Goldsmith and Bernard Herrmann. McCreary continues to write for the television show The Walking Dead. Recently he lent his talents to Marvel’s Agents of S.H.I.E.L.D., and the STARZ/BBC joint production Da Vinci’s Demons, which earned McCreary his first Emmy Award. His film projects include Europa Report and Knights of Badassdom. His other credits include critically acclaimed scores for series such as Terminator: The Sarah Connor Chronicles, Eureka and The Cape. His swashbuckling score for Human Target featured the largest orchestra ever assembled in the history of series television and earned him his first Emmy nomination. His videogame credits include SOCOM 4 and Dark Void. Syfy presents DEFIANCE, returning to Syfy summer of 2014. 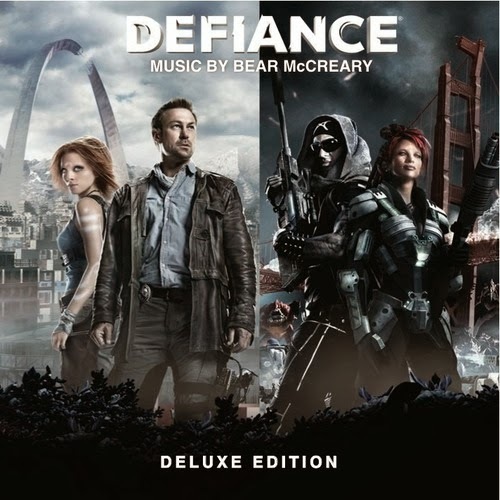 Sparks & Shadows presents the DEFIANCE Soundtrack, Deluxe Edition, composed by Bear McCreary, will be available on November 29th, 2013. The first 360 people who purchase the set through www.lalalandrecords.com on December 3rd will receive their set autographed by McCreary. An accordianist! Now that's surprising.